Intestinal obstruction is one of five most common causes of nonobstetric acute abdominal conditions during pregnancy. A wide variety of causes can present during pregnancy as in the nonpregnant population. Some conditions are significantly more common in pregnancy than in the nonpregnant population. These include cecal and sigmoid volvulus and intussusception (when compared to the female population of the same age range) due to the growing uterus which displaces surrounding organs and increased intra-abdominal pressure. The presentation is similar or the same for any underlying cause of intestinal obstruction and depends on the level and severity of obstruction. 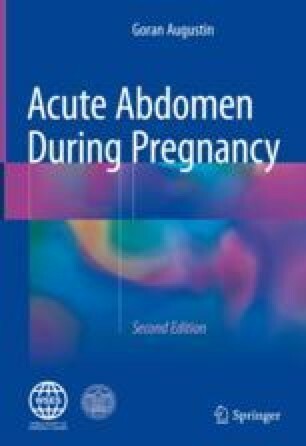 Clinicians avoid to use plain abdominal X-ray which is commonly diagnostic and adds to earlier diagnosis which influences both maternal and fetal prognosis. Conservative therapy is rarely successful except for small bowel obstruction caused by adhesions but less successful than in general population due to partially fixed small bowel kinking by growing uterus. Other causes necessitate early surgical intervention to save both the mother and the fetus.